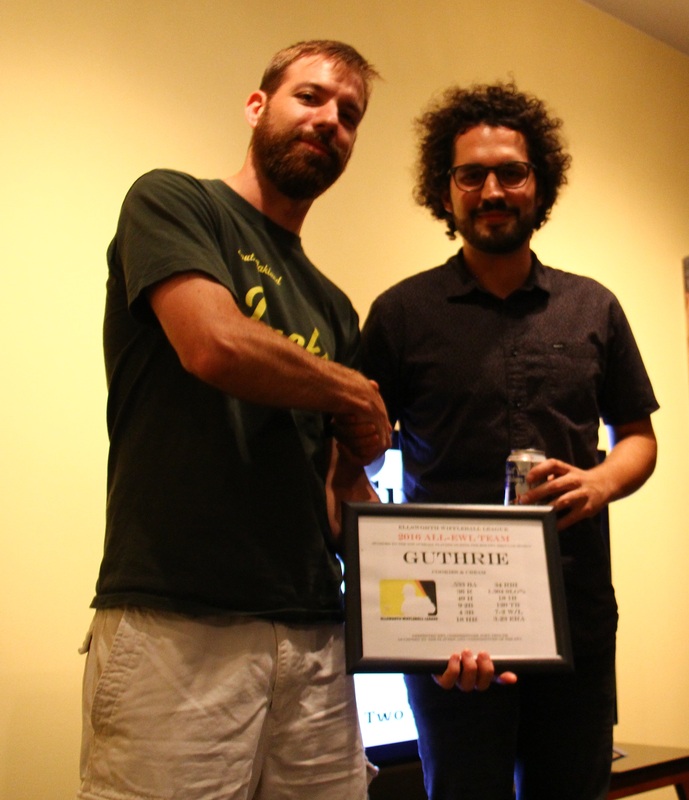 Just minutes after accepting the Pitch King Award as the EWL’s best pitcher in 2016, Guthrie was named to the All-Wiffle team for the second time in his career. Guthrie set career highs in nearly every offensive category and was a dominant force at the plate leading off for Cookies & Cream in 2016. Known for his timely playoff hitting in past seasons, Guthrie added a power bat to his tool belt in 2016, finishing in the top five in home runs and slugging percentage. He also was among the league leaders in runs, batting average, total bases, and game-winning RBIs, in addition to his stellar year on the mound. Guthrie was selected for the All-EWL team as a member of the Caucasians in 2011, and joined Blose and Joey as one of three Cookies & Cream players to be named to the All-Wiffle squad in 2016. Tim, who hit more combined doubles and triples in a single season than any other player in EWL history (36), was named to the All-EWL team for the first time in his career. After being named the EWL Rookie of the Year in 2015, Tim continued to develop his wiffle game in 2016, becoming one of the most consistent hitters in the league. He hit for .574 and was always a threat to reach at least second base when he put the ball in play. Tim finished in the top five of hits, batting average, slugging percentage, and total bases, and he led the league in both doubles and triples. Tim’s ability to extend hits into extra-base hits was made apparent by finishing among the leaders in slugging percentage despite hitting only seven home runs on the season. 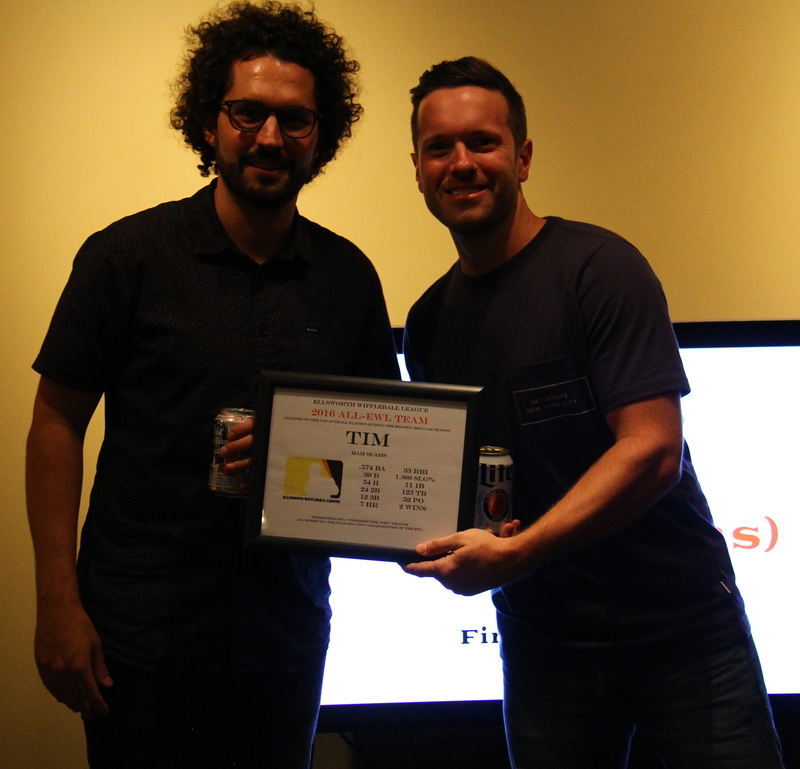 Tim was unable to attend the Wiffle Banquet, and Dan, his teammate on the Ham Slams, accepted the award on his behalf. He is only the second player in the history of the Ham Slams to be named to the All-Wiffle Team, joining Steve, who was All-EWL in 2014. After a bounce back season, Joey was voted to the All-Wiffle Team for the fourth time in his career and first time since 2013. Joey was an All-EWL player in 2011, 2012, and 2013, and returns in 2016 after putting up strong power numbers as the third hitter in the Cookies & Cream lineup and turning in the best pitching year of his career. Joey finished in the top five in doubles, home runs, RBI, and game-winning RBI as well as wins and WHIP on the mound. With Guthrie and Blose hitting in front of him, Joey had plenty of opportunities to drive in runs, and finished second in the league in RBIs, only six behind Bob and Tom, who led the league. He had his best season in the field as well, solidifying the Cookies & Cream outfield and racking up putouts from the pitcher’s mound. 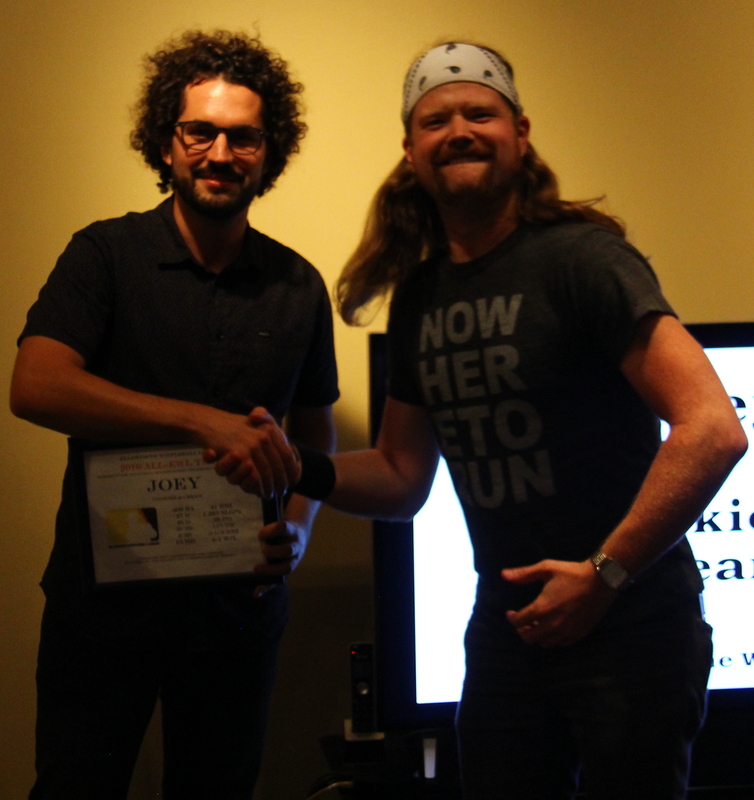 Nate, the 2016 Wiffleosity winner, presented Joey with his All-EWL plaque. 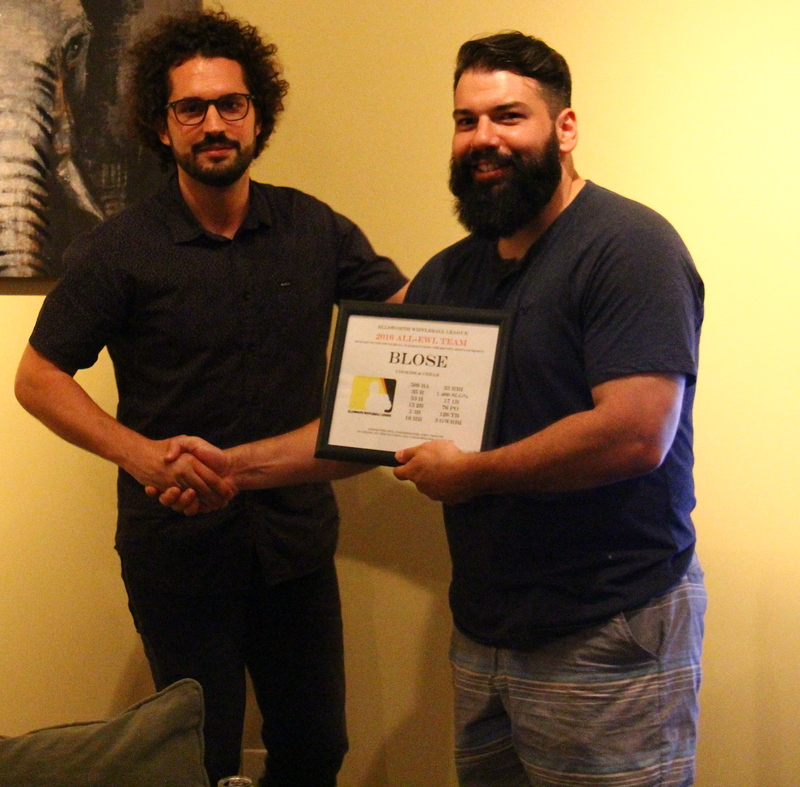 For the fourth consecutive year, Bob of Questionable Outfit was voted on to the All-Wiffle team, and his teammate, Tom, was voted for the second time in his career and first time since 2013. The most consistently dominant player in the league, Bob continued to put up staggering numbers on offense as the leadoff hitter for Questionable Outfit. Tom, the number two hitter for Questionable, racked up RBIs driving in Bob and hit .619 on the season with over forty extra-base hits. With these two players at the top of the lineup, Questionable Outfit led the league in scoring and clinched the regular season pennant. Tom, who couldn’t be in attendance for the Wiffle Banquet, finished in the top five of runs, hits, batting average, slugging percentage, singles, doubles, home runs, RBI, and total bases. He was second in many categories, and despite hitting the fewest home runs of his career, he was constantly on base, creating opportunities for his teammates to produce runs. 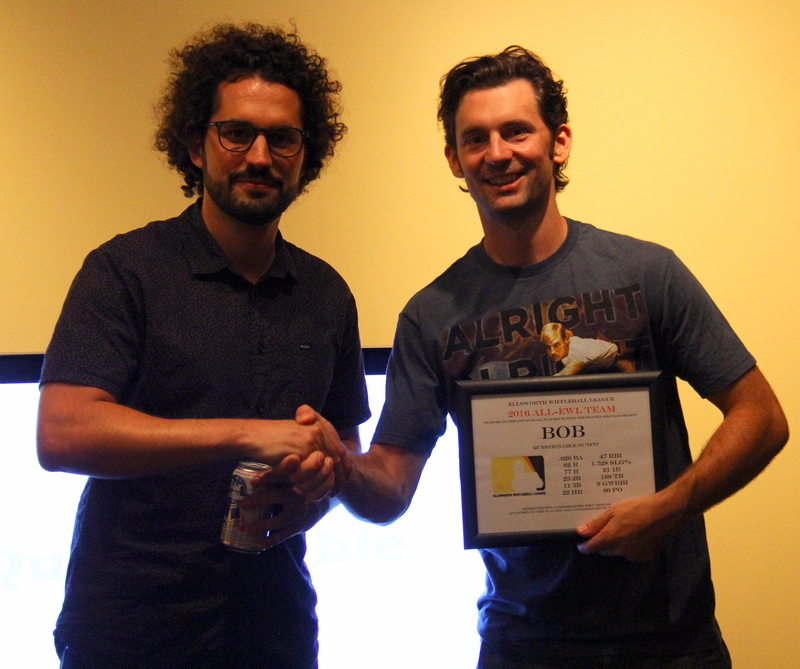 Bob, the three-time defending Wiffler of the Year, accepted Tom’s All-EWL honor on his behalf. Bob continued to cement his legacy as one of the best wifflers of all time, leading the league in runs, hits, batting average, slugging percentage, home runs, RBI, total bases, and game-winning RBI. He set career highs in batting average, runs scored, doubles, triples, game-winning RBI, and putouts. Questionable Outfit has now had at least two players named to the All-EWL team in all four years of existence in the EWL. After another stellar campaign as one of the league’s most feared hitters and most reliable fielders, Blose, of Cookies & Cream, made the All-Wiffle team for the fifth time in his career. Blose continued to be a powerhouse in the #2 slot of the Cookies & Cream lineup, hitting for average while also possessing one of the most lethal power bats in the league. Blose finished in the top five of nearly every offensive category including runs, hits, batting average, slugging percentage, triples, home runs, total bases, and game-winning RBI. He also finished among the league leaders in putouts on defense. Blose hit for the second highest average of his career, .589, and hit over .500 for the fourth consecutive season. Blose has now made the All-EWL team in all five of his full EWL seasons, and was the Wiffler of the Year in 2011. The Pitch King Award is given to the pitcher who is most effective on the mound during the regular season, and Guthrie has dominated the award since the EWL was founded in 2011. Of the six EWL seasons, Guthrie has now been named the Pitch King four times, including the 2011, 2012, 2013, and 2016 seasons. Guthrie, who holds a vast majority of the EWL single-season and career pitching records, had another dominant season the mound. He led the league in wins, opponent batting average, and complete games, and he finished second in ERA, WHIP, and innings pitched. He finished with an ERA under 4.00 for the third time in his career, won seven games for the fourth time, and finished with a win % over .700 for the fourth time in his career. The only other player to earn the Pitch King Award in EWL history is, Reilly, of Questionable Outfit, who won the award in 2014 and 2015. Guthrie finished fourth and second in Pitch King voting those years. 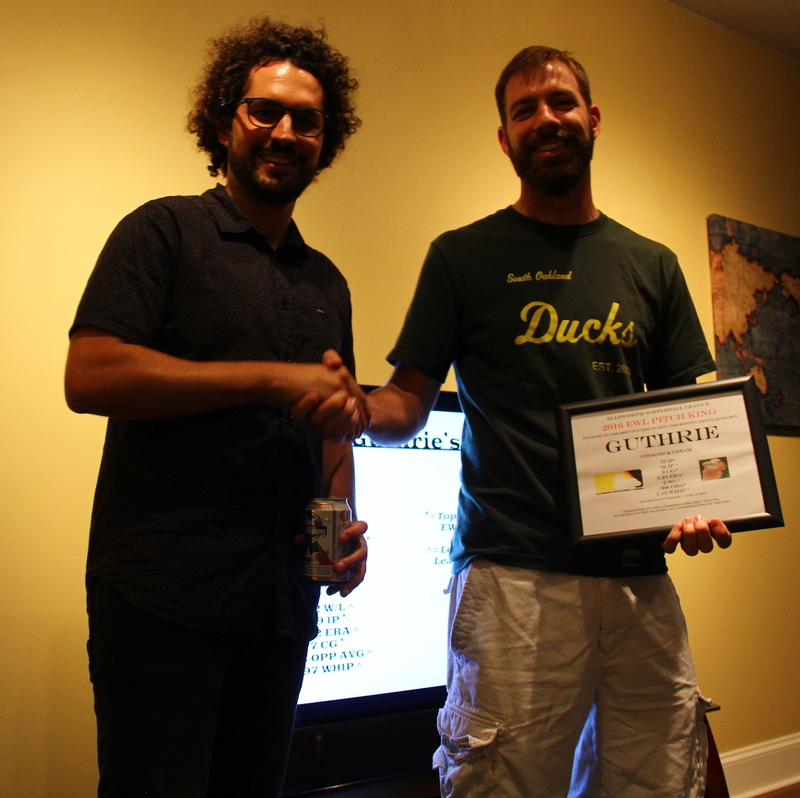 The Field Master Awards are presented to the four best defensive players throughout the wiffle season. 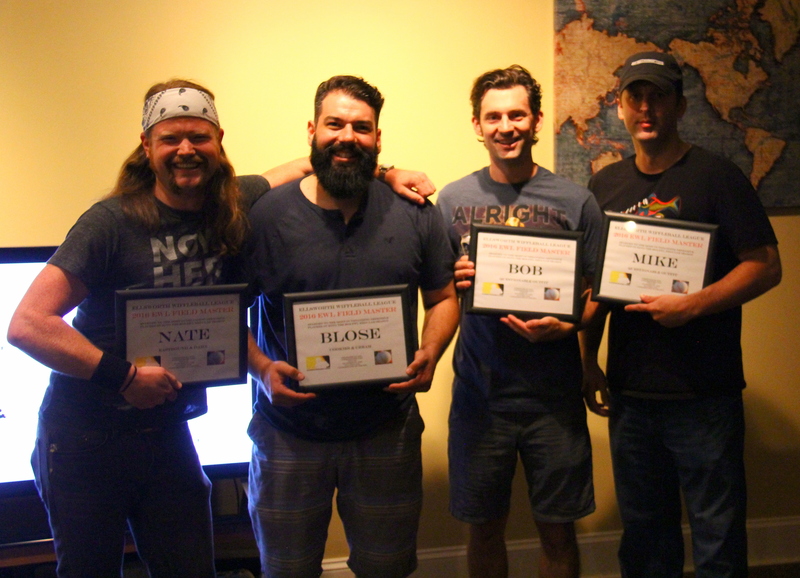 This year, Nate of Eastbound & Dahn, Blose of Cookies & Cream, and Bob and Mike of Questionable Outfit were selected as the most outstanding defensive players during the 2016 regular season. Nate led the league in putouts for the first time in his career and had a stellar season in left field as the best player on a weak Eastbound & Dahn defense. This is Nate’s first time receiving the award. Blose continued his legacy of strong defense, moving to left field this year following the departure of Vassallo from the Cookies & Cream lineup. Blose has now earned this honor four times in his career, and is the most decorated defensive player in league history. Mike was selected for the second consecutive year and third time in his career after another stellar year in left field for Questionable Outfit. Mike is known as one of the best defensive players in EWL history, and he continued to flash great catches and not led balls get past him in 2016. Bob was named a Field Master for the second time in his career and the first time since 2013 after a strong campaign in center field and on the mound for Questionable Outfit. His reliable fielding helped propel Questionable Outfit to the #1 seed in the playoffs. Past winners of the award include Morrison (four time winner for multiple teams), Hartley (two time winner for Eastbound & Dahn), Steve (two time winner for the Ham Slams), Vassallo (two time winner for the Fish Sticks), Luke of Pumice on Slow!, Brad of Downtown Bobby Brown, Tom of Questionable Outfit, and Anthony of the Ham Slams.